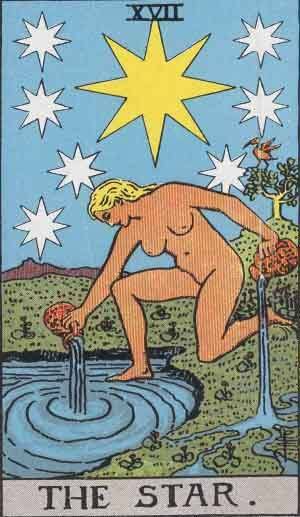 The Star is the 17th Major Arcana card. At face value, The Star is a positive card, making you feel inspired, wondering and confident. Stars, and constellations, have become a large part of occult mysticism. The Star reflects some qualities of this. The Star represents calmness, hope and inspiration. Past – The Star in the Past position means that you could be recovering from a past altercation or conflict. This isn’t necessarily a physical conflict, it could also mean a period of stress. Realise that it’s all over now and you can start your recovery. Present – The Star in the present position represents a current period of peace that you’re enjoying. You might have just accomplished something great! It’s always good to have downtime, you don’t want worldly pursuits to overcome who you really are. If you’ve just accomplished something big at work or school, congratulations. Treat the present as a time to relax, recoup and reflect on your achievement. Future – The Star in the future position could mean that you’re currently struggling with something. Don’t worry, you’ll overcome it one way or the other. The struggle could mean that you’re looking at something from only one point of view. Get a dual approach .Ask somebody you wouldn’t normally ask. Put your trust in someone new. Work / Education – The Star in regards to work or education means that work or schooling should be going well. Expanding on the points made above, The Star also reminds you that new paths could be coming your way. Keep your eyes open for new opportunities. It’s a harsh world out there and you need all the help you can get. You need to put in to take out. Like pouring water into a lake and onto land, life is full of duality. Romance – The Star in romance means now is a good time to talk to your partner in a new and interesting way. Take things to new levels and experiment, but only to a degree that you’re both comfortable with. Don’t worry about getting rejected if you propose an idea to your partner. If you’re single, now is a good time to meet somebody new. Go get out there. With nothing else on your mind, you can focus on finding someone. Friends – The Star in regards to friendship means you will become familiar and comfortable with your friends in new ways. You might have just done something together that has helped you all bond. Now isn’t the time to push the envelope and go to the extreme. just hang out and live life. If you’d like some new friends, just look for people with similar interests. Local hobby groups would be a good idea, you can try an internet forum dedicated to your interests too. Money – The Star in regards to finances means things should be going well in regards to finances. Take risks if you want to, but make sure they’re calculated ones. You might be in a situation where you have everything to gain and nothing to lose. Think about it, are you? It might be a good time to ask for a pay rise! Spirituality and Mentality – The Star in spirituality means now is a good time to share what you’ve learned so far. Treat it as reaching a plateau of knowledge, now you have time and enough knowledge to give to others. Consider this current time of your life may be nearing it’s end. You have been reaping the rewards of a period of peace but soon it’ll be time to put the work in. Consider any unused skills you have, and how you can put them to work to help yourself and others. Sometimes, we might have a week or two where things start to bother us, or where we can’t just find ourselves relaxing due to worry or stress. You may be about to have one of these weeks when you draw The Star reversed. We’ve selected live tarot readers to give you a FREE 3 Minute interpretation of the Star! Scroll through them below and pick your favorite one.